Singer, songwriter and pianist Regina Spektor has announced that she is to play a four-date tour later this year. Starting on 30th November at Birmingham's O2 Academy, she will also play Glasgow on December 1st, Manchester on December 3rd and London's HMV Apollo on December 4th - very short, but very sweet. 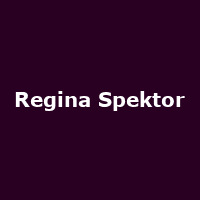 Soviet-born and now New York resident Regina's been quite quiet in the UK of late, her only recent date being at Hyde Park's Serpentine Sessions during the summer - you know, that season that just finished? The winter tour announcement marks her first 'full-length' UK tour since she released her album 'Far' back in June. However, she's currently touring the US extensively until mid-November, and then will come to the UK before continuing onto mainland Europe. That's one busy lady! Tickets are on sale now, priced at £22.50-£25 (+ booking fee).